This is an independent queuing model simulator. No additional software needed. You must have a standard hardware, the minimal requirements are : a PC, Windows 8 or later, more than 60 Mb Ram, recommended minimal 1024x768 pixels screen resolution, at least 16-bit color. The Queuing Model Simulator (QMS) was created using the PSM++ simulation system, but you can use is without installing PSM++. It is particularly useful for teaching simulation, manufacturing systems and mass service modeling. QMS is very similar to the PSM++ QMGW module. Both programs accept up to 1000 blocks per model like queues, servers, assembly etc.. However, QMGW, being apart of a bigger simulation package, is more flexible and versatile. This is due to the fact, that QMGW generates PSM++ source code that is automatically translated to Delphi Pascal, compiled and executed. So, the user can include his own Pascal procedures. QMS does not support such features, but it is still quite useful and easy-to-use tool. The random number generators of QMS can be selected from a list of several more useful distributions, including a user-defined sample distribution, given by a histogram. QMS package includes the PSM++ module VARAN, which provides additional statistical analysis, like the confidence intervals and variance shown as functions of time. The QMS model is defined graphically, using the following blocks. Then the user defines the parameters of the blocks. The option "Simulate" of the main menu invokes the simulation procedure. The following figure shows a fragment of a QMS scheme, a part of a manufacturing model. The red blocks are buffers or queues, blue ones are servers and the vertical green blocks are assembly operations. The following figure is an example of a QMS result screen (from other, smaller model). The red animated horizontal bars show the queue length, they move following the changes of the corresponding queue length. At run time the user defines the simulation final (model) time and the number of repetitions. If only one repetition is requested, a single simulation run terminates, showing the time-plots of the length of all queues (example on a figure below) and the final statistics in numerical form. If the requested number of repetitions is greater than one, then after the last repetition QMS invokes the PSM++ VARAN program that pderforms some statistical analyses over the stored set of model trajectories. The results include average trajectories, variance, max and min values and confidence intervals, all as functions of time. The follwong example shows an example of the plot of the confidence intervals of the length of one of the queues as function of time. The similar information is shown as 3D images of the probability density the queue length in function of queue length and time. The following figure shows an example of such image in black and white version. 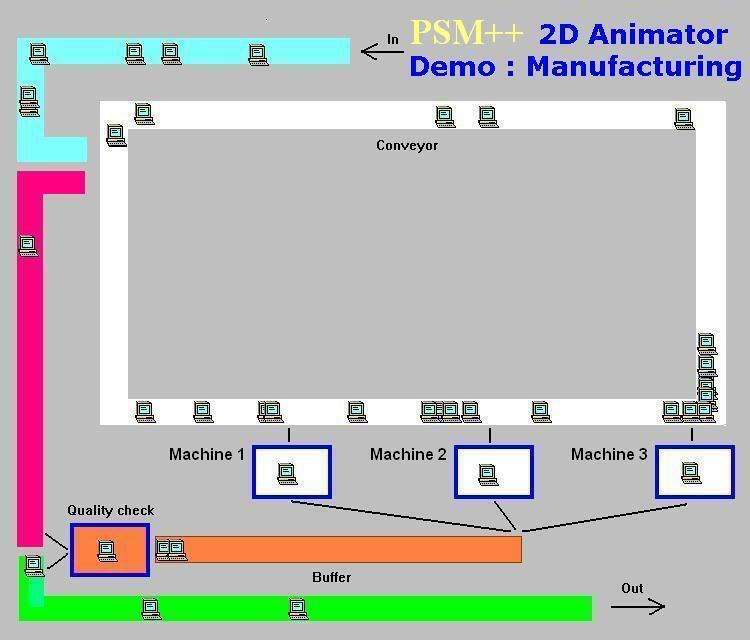 The new feature of QMS is the compatibility with the PSM++ Animator. Below you can see an example of the animation screen. The background (model layout) is a user-edited bitmap imapge (.bmp). As the background you can use any image, including a photo of a real mass-service or manufacturing system. Main executable file is execute QMS.EXE. NOTE: If your payment is accepted, you will receive the installation instructions by e-mail. This is not automatic, be patient. Please provide an altenative e-mail addres, sometimes we cannot communicate with the customer (bad anti-spam or so).